Kitazato USA by California Cryobank is the exclusive distributor of Kitazato products in the US, offering a range of FDA compliant medical devices specially designed for the American market. Kitazato is one of the leading manufacturers of devices for human assisted reproductive medicine and the innovator of the advanced Cryotop® Method vitrification technique. After more than a decade on the market, the Cryotop® Method has been applied in over 1,500,000 clinical cases in over 90 countries and 2,200 assisted reproduction centers. Hundreds of scientific publications certify the Method’s impressive results. The Cryotop® is a special vitrification device consisting of a fine, thin film strip attached to a hard plastic handle for the minimum volume cooling to realize the highest cooling & warming rates, resulting in over 90% post-thaw survival. Cryotop® has been fine-tuned for the US market and is now readily available to help achieve the highest survival rates possible utilizing a closed system. Cryotop® vitrification has been proven to be the most effective method available for fertility preservation, offering the highest survival rates within the industry for both oocytes and embryos. For more information, please visit http://www.kitazato.co.jp/en. With its revolutionary design and protocol, the Cryotop® Method has a high cooling and warming rate. Several studies have shown that the warming rate is more crucial for increasing survival rates. Furthermore, all Cryotop® and Cryotop®US products are developed and patented by Kitazato. 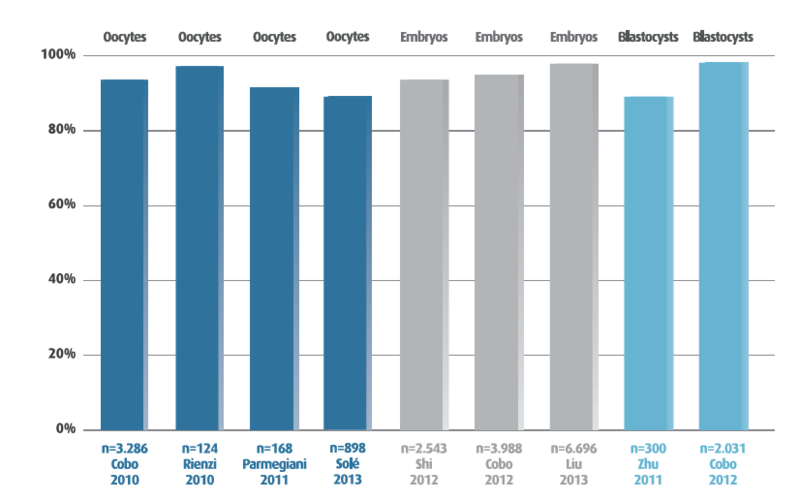 There are high survival rates for oocytes and embryos in all stages of development, reported in numerous clinical publications, with the largest study samples in the whole sector. Kitazato USA offers easy access to an impressive selection of innovative products engineered by Kitazato. Through Kitazato USA’s exclusive distributorship, accessing these state-of-the-art devices has never been faster or easier. Overnight shipping is available anywhere in the continental US on all regularly stocked items. Need help with training your team or have questions about improving your lab’s outcomes? Let Kitazato USA’s dedicated team of highly trained embryologists help. We are happy to work with your staff to make sure you are achieving the most consistent and successful results possible.